First, paint your step stool with white paint as a primer and let dry. Next, paint the stool in your color of choice. Cut your scraps of paper or fabric in desired shapes. I am inspired by quilts so I kept that in mind when I came up with a design. If your fabric is thin (like some of the cotton fabric scraps that I used), I suggest gluing it down (with spray glue or a glue stick) to white card stock first and then cutting out your shapes. That will prevent fraying as well as keep your design opaque once mounted to the stool...even if your stool is painted with a dark color. After your shapes are cut, set aside and paint a layer of Mod Podge over your surface. Next, lay your fabric or paper down and coat with another layer of Mod Podge over the entire piece. 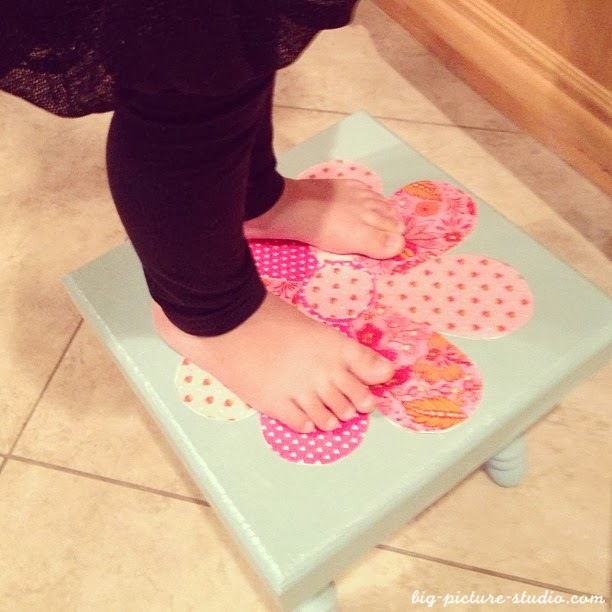 Smooth out any bubbles in the paper or fabric, let it dry, and then enjoy giving your one of a kind step stool made with love to that special sweet and tiny toddler in your life.